This headstone marks the grave of an 11-year-old boy killed during clashes in the streets over the boycotting of British goods. Christopher Seider was a collateral casualty of the protests that ushered in the American revolution. On a cold day in February, 1770, Seider joined a rowdy protest in the North End. The angry mob was raging against a new sugar and molasses tax imposed by the British. Seider was just eleven years old. He followed the crowd as they chased Ebenezer Richardson, a Customs worker protecting a Loyalist merchant from the violent protests. Richardson wasn’t the most trustworthy citizen, and wasn’t the most popular around town - perhaps for rash decisions like the one he made that fateful day. After the crowd pummeled Richardson with stones, he shot into the crowd, puncturing Seider’s lung. The boy would not live to see the American Revolution - he died that evening - but the patiots used his death as an impetus for the Boston Massacre two weeks later. Seider is said to be the first victim of the American Revolution. 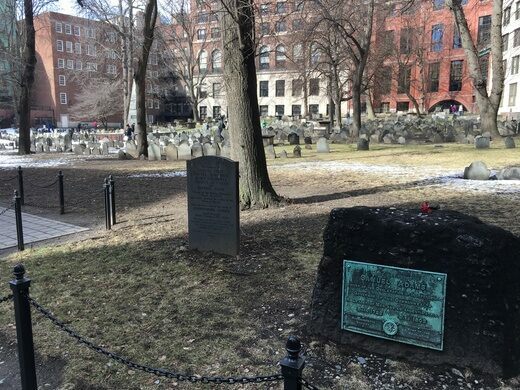 Although the incident took place in the North End, he is laid to rest at the Granary Burying Ground. His coffin read “innocence itself is not safe”. 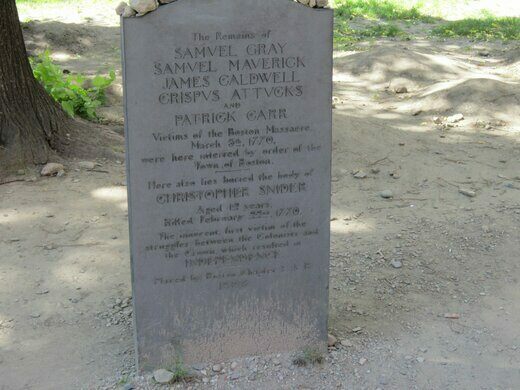 When entering the graveyard take an immediate right and it’s the grave left of Sam Adam’s.